Basia was not confident, was feeling very sad and empty, and was very quiet when she first came to the music therapy group. She said she was finding it difficult to meet other people and to look after her children. Basia played the quiet, small instruments and seemed afraid of the louder instruments and drums. 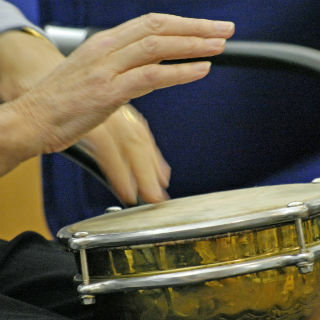 Basia attended the music therapy group for several months. Through the support of the group, other group members, therapists and the music, Basia began to make louder sounds. As her confidence grew, over time, she chose the louder and bigger instruments. She played the drum and enjoyed being heard. One week, Basia brought in a song that was special to her, and sang it to the group. As time went on, Basia was able to start to share some of her personal story with the group. Trust had grown and she was able to talk with other people in the group more easily. She began to feel less sad, and could leave the house more. She could do more things in her community. After Basia left the group she found a college course to go to in something that interested her. She has also found it more easy to talk to people and support her children more. Paul came to a Soundwell group for fifteen months. He has a long history of psychosis, severe difficulties forming relationships and many failed attempts at work/college. When he first came to the group he lived at home, was unemployed and was unable to use public transport. Music Therapy had actually been identified for Paul as an unmet need by his care team – since before Soundwell formed there was no music therapy for people with mental health needs in the area. When he first attended the group he was extremely anxious and found talking very difficult. His sense of his own worth was also very low. While Paul found talking to people very hard, he found communicating through music much easier and over many months group work using the instruments he started to make good relationships with other group members and began to feel part of the group – he started to feel he belonged and felt he fitted in. At the same time he started to feel better about himself, which made him feel less anxious in the group, which made communication easier. After about a year of this positive cycle, Paul found work and the group supported him through the difficult transition period of getting to know new work colleagues. After his first few months in the job he felt ready to leave the music therapy group. Paul continued to work, including changing jobs during that time, and moved out of his parents home into his own flat.